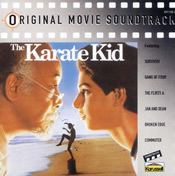 The Karate Kid soundtrack is decent for fans of 80's music and awesome for fans of the movie. If you're neither, it's definitely not for you. Unfortunately, Joe Esposito's You're the Best has become so cliche these days that it's lost much of the coolness it used to have. In my opinion, the downfall of this song started when it was used on a Season 1 episode of It's Always Sunny in Philadelphia. Even though it was hilarious at the time, it's been way overused since then. My personal favorite from the soundtrack is Young Hearts by Commuter -- although I will say that I was pretty excited to see Matches' The Ride show up on iTunes recently. If you're a longtime fan of the Karate Kid and you've not paid your dollar for this long-lost song, it's well worth every penny. Interested in the original score from all three movies (I refuse to recognize that train-wreck with Hillary Swank)? Snoop around online. It's out there and is very fun listen. Almost made me want to wash and wax my car. Maybe even paint the fence. Throughout much of the show's original run, my brother kept a scrapbook of Knight Rider clippings found in magazines and newspapers -- a majority of which came from TV Guide. In one of the countless examples of a time when I copied an idea off my older brother, I also kept a scrapbook. 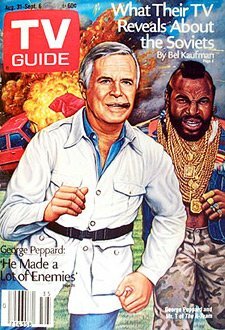 Mine, however, was clippings of the A-Team. When Karate Kid Part II was released, Chips Ahoy ran a promotion where packages of cookies included a poster from the movie. I can't remember if there were multiple posters or just one but I had one that hung on my wall for years. 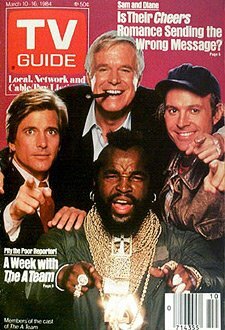 I've scoured the internet up and down, forwards and backwards...but can't find a shot of this poster to save my life. Any help out there? That's it, folks. The movies open tomorrow. Of course, I'm dying to see both but I absolutely hate going to the movie theater (people talking, cell phones ringing....I'd rather wait on the DVD so I can watch in peace). I'm trying to decide whether or not to hit the theater bright and early in the morning to try and catch both movies before the masses of jibber-jabbering fools show up. I could have gone on another week with the masses of A-Team and Karate Kid junk I remember (pajamas, video games) and even some stuff from adulthood (I'm always proud to wear my Cobra Kai shirt)...but this seems a good stopping point. I still have my Karate Kid Part II promo poster from Chips Ahoy - but I can't find any info either - shall I scan it in? Jared -- If you have the means to scan the poster, I'd love to see it! Thanks! I have the poster as well.